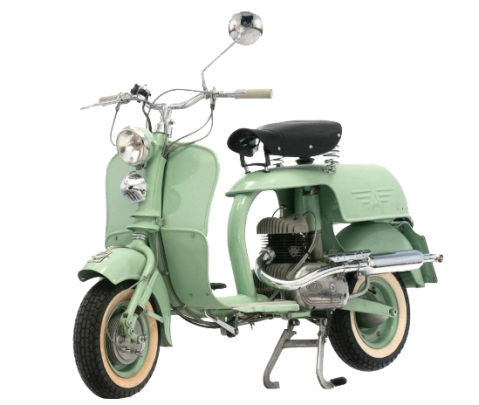 By 1951, the battle for the Italian scooter market was at a fevered pitch. MV was determined to field a credible scooter; the result was the “Ovunque” (“Everywhere”). The main characteristic of the “Ovunque” is the single beam frame, constructed of large diameter tubing. While the engine used the same block and similar as four-speed models, the “Ovunque” used a three-speed transmission with a wist-grip gear selector on the handlebars. The rear suspension was rider tidy; it was a swingarm design that used the engine as an integral part, as well as a single hydraulic schock absorber. Two versions were built; the Q51, wich used a single exhaust, and the Q52, that utilized a double exhaust system. A popular, production was approximately 10.000 units.